Fred Miller, pioneer resident and early day business man of Watertown, answered the summons of death in the family home, 600 Third Street, on Wednesday evening, following a general breaking down of the system due to the infirmities of old age. Had he lived until the 26th of the present month he would have been 88 years of age. His health began to fail eighteen months ago since which time he has been confined to his home, receiving the tender care of a devoted wife. Mr. Miller was born in Bayrische, Rhein, Pfalz, Germany, October 26, 1833, and was educated in his native town. At the age of 22 he came to this country and to Watertown in 1855, shortly after entering the employ of the late William Buchheit, and in 1858 formed a partnership with the late Charles Jacobi under the firm name of Jacobi & Miller, distillers and liquor dealers, which continued until 1866. In 1867 he formed a partnership with the late Christ May which firm did a large cooperage business with sawmill and stave factory on a large scale and which continued several years. In 1881 in company with Jonas Sleeper he engaged in the manufacture of flour at the Brick mill, the site of the present waterworks plant. The firm was known as F. Miller & Co., which later became the Globe Milling Co., the output of which at one time was 70,000 barrels of flour a year, and sold out his interest in 1885. After disposing of his milling interests he entered the grain business here with the late Henry Pritzlaff and upon the death of the latter continued with H. Wertheimer in 1888 and retired from active business pursuits a few years later. Mr. Miller was always the keen man of business with a large capacity for work which combined with good business judgment rendered successful the various undertakings with which he was connected. When the Wisconsin National Bank was organized, which followed the old Bank of Wisconsin, February 6, 1865, he became identified with the institution as a stockholder and has been a director of the institution since its inception. He served one year as its head following the death of President Daniel Jones, and was the last of the original stockholders, the others being William M. Dennis, P. V. Brown, Daniel Jones, Dr. Edward Johnson, Dr. James Cody, Charles Jacobi, A. F. Matice, Waterloo, H. Mulberger, Sr. He never aspired to political honors, although his ability was recognized by all, being content with a business career and the home life which he loved so well to the exactions of political preferment. Mr. Miller was united in wedlock in 1864 with Minna Riehl of Milwaukee, who survives him. He was the father of two daughters, both of whom preceded him in death. One sister, Mrs. John Weber of Cincinnati, also survives. Mr. Miller was one of the most familiar figures in Watertown and was known by practically all our citizens, as during his long business career he came in contact with many people who grew to know him as a man of worth and integrity. While devoting a large share of his time to business pursuits he always retained a portion for the home life and the social activities and was always a welcome guest at any of the social functions in the early days which he graced by his presence. His nature was of the sterling stuff that wins and keeps friends and his active and cheery presence will be missed from the familiar paths of life, and Watertown loses one of its best and for many decades its most prominent citizen who rounded out so many years of usefulness. He possessed a kindly nature and never turned aside a worthy appeal for assistance, while taking an active interest in the business development and welfare of the city. The announcement of his death is made with profound sorrow which the whole community will share because of the realization of the high worth of this good citizen. The funeral will be held from the family home Saturday afternoon at 2 o’clock. Services will be conducted by the Rev. N. C. Daniell of the Congregational church and the burial will be in Oak Hill Cemetery. The Mattek home was built in 1888 by Fred Miller. At the time Miller was vice president of the Watertown Gas Company; Jesse Stone was president of the company. The home was purchased by the Rev. Jim and Sue Mattek in 1990 from Professor Hollawood who taught at Maranatha Baptist Bible College. 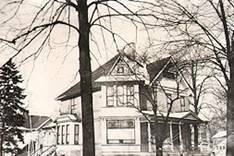 When the Matteks purchased the home, they classified it as a very sad lady who at one time had been very dignified. The maintenance of the home had been neglected for many years. It had been Sue Mattek's lifelong dream to own and refurbish an old home, but she did not envision the months and years that it would take to make this home the showcase piece it is today. Sue Mattek was attracted to the home because of its great interior woodwork and its stained-glass windows. In the years after their purchase the woodwork was refinished, the ceilings and wiring replaced, and layers of wallpaper and linoleum removed.